This page has moved to the UCS Arts Newsletter site – here, please bookmark – where it is being actively updated. Things to do in Ipswich, free or under £6 (inclusive), easy to get to. Shamelessly ripped off from the old Village Voice page of things to do in New York. Work by Ipswich artist Andrew Vass, captured in situ near the Waterfront. Related exhibition, the ground on which we walk with drawings by Vass and photographs by Mark Edwards, runs through May 1 at UCS Waterfront Gallery. Wed May 8 – Twenty Thirteen, opening of exhibition by first year fine art students at UCS, in the Atrium Studios space (West Building), 5:30 pm to 7:30 pm. This is the first major exhibition by the newest class. Subjects including identity, gender, politics, realism, process and space will be explored through paint, print, sculpture, drawing, and lens-based media. Wed May 8 – Rebecca West, lecture by Lorna Gibb, author of West’s World. 7 pm for 7:30 pm, Ipswich Institute, 15 Tavern Street. £8, half price for Suffolk Book League members (£15 to join), and free for students with valid ID. Tea and coffee served. Thurs May 9 – “Developing Arts and Entertainment in Ipswich,” Atrium Studios Connect Talk with Greg Cooper, Cultural Development Manager for Ipswich Borough Council. Lecture Theatre 5, UCS West Building, 6 pm. Further guests from Colchester + Ipswich Museums (Jayne Austin), New Wolsey Theatre/Pulse (Laura Norman), IBC/Ip-Art (Sarah Fisher), Re-create (Chris Shutt, Eastern Enterprise Hub and Cad Taylor, CSV). All welcome. RSVPs: atriumstudios@ucs.ac.uk. Thurs May 9 – Dorkbot Anglia, “people doing strange things with electricity,” open evening with talks 6 pm to 9 pm at Pacitti Company Think Tank, One Upper High Street. Begins with a screening, then talks by Ed Perkins (translating data into music), Mark Langford aka Kiteman (the Large Hadron Collider), Nat Bocking (tracing people in a found family album) plus an “OpenDorks” session for anyone to get up and talk. Free entry. Sat May 11 – Ipswich Record Office Open Day, 9:30 am to 12:30 pm at the County Council building on Gatacre Road. Recommended for journalism students. Thurs May 16 – Salon with associates Johanna Linsley, John Bowers, Lucy Walker – dialogue with a scifi writer, a technologist and an archaeologist, at Pacitti Company Think Tank, One Upper High Street. £4, beer and wine for sale by the glass. Sun May 18 – equals, exhibition of work by UCS photography students, opens at Ipswich Museum / Ipswich Art School,1 Upper High Street. Runs through Sept 1, open Tues-Sat 10-5, also at Slack Space Colchester June 12 – 22 (open Wed-Sat 11:30-6). Wed May 22 – Poetry Workshop with the Suffolk Poetry Society, 7 pm to 9 pm, UCS, free but registration required. Share your poems-in-progress with other poets. Thur May 23 – Forensics at the Table (event), an evening of feasting and forensic exploration of memory hosted by artist Giovanna Maria Casetta, whose work explores the fragility of memory. Lois Keidan of Live Art Development Agency and a forensic psychology expert will also speak. 6:30 pm at Pacitti Company Think Tank, One Upper High Street, £10 / £8 includes two-course meal. Forensics at the Table (installation) open 11 am – 4 pm Fri and Sat in same location, free entry. Wed May 29 – Life Writing / Alternative Life Drawing (The Shadow) – “This session encourages participants to consider our bodies as unique archives of experience, through text.” Bring writing materials, pens, paper or digital. Pacitti Company Think Tank, One Upper High Street, £6. Sat June 8 – Emily Dickinson, lecture by Graham Fawcett of the Poetry Society, part of his Seven Olympians tour, 5 pm. Unitarian Meeting House. £10 includes wine and refreshments so really less. Booking advised; contact Rev. Jim Corrigall. Wed June 12 – “I never noticed that,” evening walk in Ipswich with the Ipswich Society (£6 to join for a year). Wed June 26 – New Angle Prize Shortlist Showcase, All six shortlisted authors will give readings and participate in a panel. 7 pm at the Ipswich Institute, 15 Tavern St. Tickets £7.50 from Ipswich Institute, includes glass of wine (so really under £6 …). Sat June 27 – Religion and Poetry in TS Eliot, 7 pm for 7:30 pm, a public lecture by the Rev. Jim Corrigall focusing on Four Quartets illustrated with readings and music from the Beethoven quartet that inspired Eliot. Unitarian Meeting House, free entry. Tues Sept 10 – Alex Preston (The Revelations, The Bleeding City) speaks at Suffolk Book League. 7 pm for 7:30 pm, Ipswich Institute, 15 Tavern Street. £8, half price for SBL members (£15 to join), and free for students with valid ID. Tea and coffee served. Wed Oct 9 – Jerry Brotton (A History of the World in 10 Maps) speaks at Suffolk Book League. 7 pm for 7:30 pm, Ipswich Institute, 15 Tavern Street. £8, half price for SBL members (£15 to join), and free for students with valid ID. Tea and coffee served. Thur Nov 7 – Louise Doughty (A Novel in a Year) speaks at Suffolk Book League. 7 pm for 7:30 pm, Ipswich Institute, 15 Tavern Street. £8, half price for SBL members (£15 to join), and free for students with valid ID. Tea and coffee served. Wed Dec 11 – Sue Prideaux (Edvard Munch: Behind the Scream; Strindberg: A Life) speaks at Suffolk Book League. 7 pm for 7:30 pm, Ipswich Institute, 15 Tavern Street. £8, half price for SBL members (£15 to join), and free for students with valid ID. Tea and coffee served. Sun May 5 – Ipswich May Day Festival, noon-8 pm, Alexandra Park. Union speeches, solidarity, and two stages of music. Wed May 1 – UCSJournalism seminar on hyperlocal press with Jon Kingsbury of NESTA, 12 pm to 2 pm, Auditorium 5 (Atrium Studio basement), UCS. Free entry. 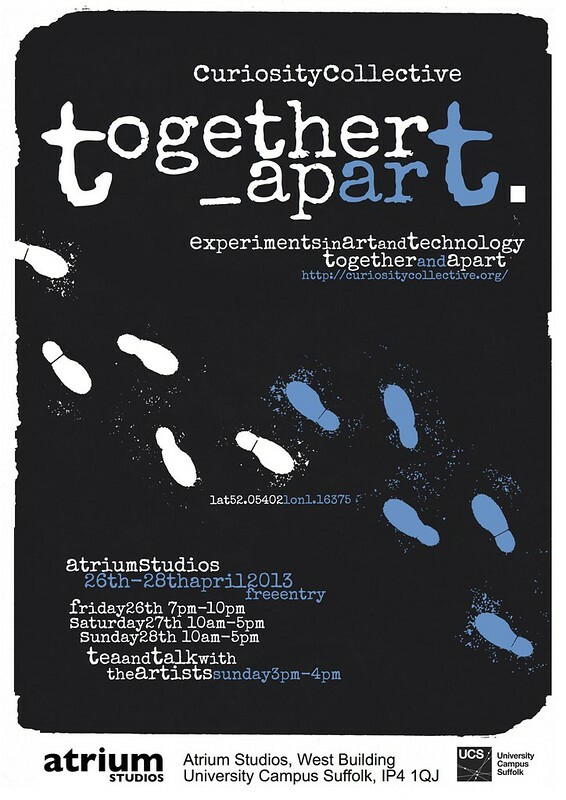 Fri April 26 – Sun April 28 – Together Apart – Experiments in art and technology with Curiosity Collective / Ipswich Hackspace at UCS Atrium Studios. Reception Friday 7 – 10 pm; tea with artists Sunday 3 pm. Free entry. Sun April 28 – Holi Festival of Colour, Indian celebration of Spring in Holywell Park, 2:30 to 5:30 pm, postponed from March because of bad weather but now it’s going to happen. Dress for paintball if you want to get into the paint throwing! Tues April 30 – Between King and Pope: Thomas Wolsey and Anglo-Papal Diplomacy, third annual Wolsey Lecture by Dr. Jessica Sharkey, UEA, 6:30 for 7 pm, UCS Waterfront Auditorium. Free entry. Tues April 30 – Ipswich Game Developers’ Network, 10-minute talks, Brewery Tap, 6:30 pm. Free entry. Thur April 10 – Is East Anglia’s buried and unexplored heritage being pilfered in an unsustainable way? UCSHeritage seminar with Warsaw-based British archaeologist Paul Barford discusses issues related to metal detecting and other activities, 4:30 pm, UCS Waterfront room 602, free. Wed April 17 – Poetry Workshop with the Suffolk Poetry Society, 7 pm to 9 pm, UCS, free but registration required. Share your poems-in-progress with other poets. Wed April 24 – Game history lecture by David Parlett, 2 pm, Waterfront 416. Wed April 24 – Artist talk for the ground on which we walk by Mark Edwards and Andrew Vass, chaired by Jevan Watson, 6 pm, UCS Waterfront Gallery, free admission. Exhibition features new explorations of eastern landscapes such as those painted by Gainsborough, by photography lecturer Edwards and Atrium Studios associated artist Vass. Runs through May 1. Thur March 28 – Atrium Studios Easter Exhibition opens, 6:30 pm, UCS Atrium Studios in arts complex north of Waterfront. Exhibition runs through April 1. Free admission. Wed March 27 – Life Writing: Alternative Life Drawing Beyond the Body, Pacitti Company Think Tank in the Ipswich Museum and Art School complex, 5-7 pm, entry £6. “In homage to the building’s original use, and re-imagining life drawing as a traditional subject, this session will encourage participants to describe the body through text. You are asked to bring along writing materials, be those pen and paper or digital means. A life model will sit for the group. The session will be facilitated by artist Robert Pacitti.”Sat March 23 – Social Bike Ride, 9:30 am, leaving from Pedal Power in Martlesham, apparently free. Sat March 23 – Stride: The UCS Spring Dance Show, Jerwood Dance House, 7:30 pm, £5 / 3.50 concs. Featuring commissioned pieces by choreographers Tom Hobden and Divya Kasturi as well as work of first, second and third-year UCS students. Thur March 21 – Archaeology in a Local Government Context, UCS Heritage Seminar, 4:30 to 6 pm, UCS Waterfront 602, free, refreshments provided. A look at archaeology within a county council’s portfolio of responsibilities. Guy McGregor, Suffolk County Council cabinet member for roads and transport, will talk about the situation in Suffolk, reflecting on the changing role of local authority. Thur Mar 21 – Midterm film showcase by BA (Hons) Film students, 6 pm to 7 pm at UCS East Building Lecture Theatre 3, free admission. Wed Mar 20 – Opening of the ground on which we walk, 6 pm to 8 pm UCS Waterfront Gallery, exhibition runs through May 1, free admission. New explorations of eastern landscapes such as those painted by Gainsborough, by photography lecturer Mark Edwards and Atrium Studios associated artist Andrew Vass. Tues Mar 19 – Poetry Workshop with the Suffolk Poetry Society, 7 pm to 9 pm, UCS, free but registration required. Share your poems-in-progress with other poets. Tues March 19 – UCS Postgraduate Studies Information Evening, Waterfront Infozone, 4 to 7 pm, talk on postgraduate funding at 4:30 pm in Lecture Theatre 2. If you’ve ever thought about doing a PG degree, pick up some information and raise a glass with us while you’re here. Sun March 17 – Access All Arts, Ipswich Town Hall, 10 am to 4 pm. Exhibitions, performances, workshops, craft fair, cafe, live music. Includes The Business of Music workshop with Phil Pethybridge (register), performance by Funky Voices choir at noon, a knit-in for breast cancer, and the activities below. All events are free. Sun March 17 – Festival of the Beats, Ipswich Town Hall. Poetry open mike, 12:30 pm to 1:45 pm, art exhibition featuring local artist LA LA, 12 pm to 4 pm, and Paul Fisk‘s film of a martial arts master showing at 2:30 pm and 3:30 pm. Taster for next year’s full-length Festival of the Beats. Sun, March 17 – Derelict Beauty: An Ipswich Journey, Ipswich Town Hall. Film by UCS BA (Hons) Dance students of their site-specific dances performed at locations from Christchurch Mansion to abandoned buildings. Screenings hourly at noon (no commentary), 1 pm, 2 pm and 3 pm (with commentary). * Community organisers! This is how detailed your mass transit directions ought to be. Which bus, from where, what stop to get off at, how far it is from there.